I can’t believe it’s been nearly a month since I posted to the blog. In the past I’ve had long absences due to the World Cup or vacations. This time it was the Olympics. I make no apologies; I am an Olympicophile. I watched much as I possibly could even if it meant staying up late and dealing with an Olympic hangover the next morning. The Olympics ended a week ago and I’m still going through withdrawal. On the bright side, the USA track and field team did awesome. Lots of middle distance and distance medals. Throw in some drama with dropped baton passes, disqualifications and even a brave finish after falling and tearing an ACL. During the time all of this was going on, something strange started happening in my garden. Disappearing squash. 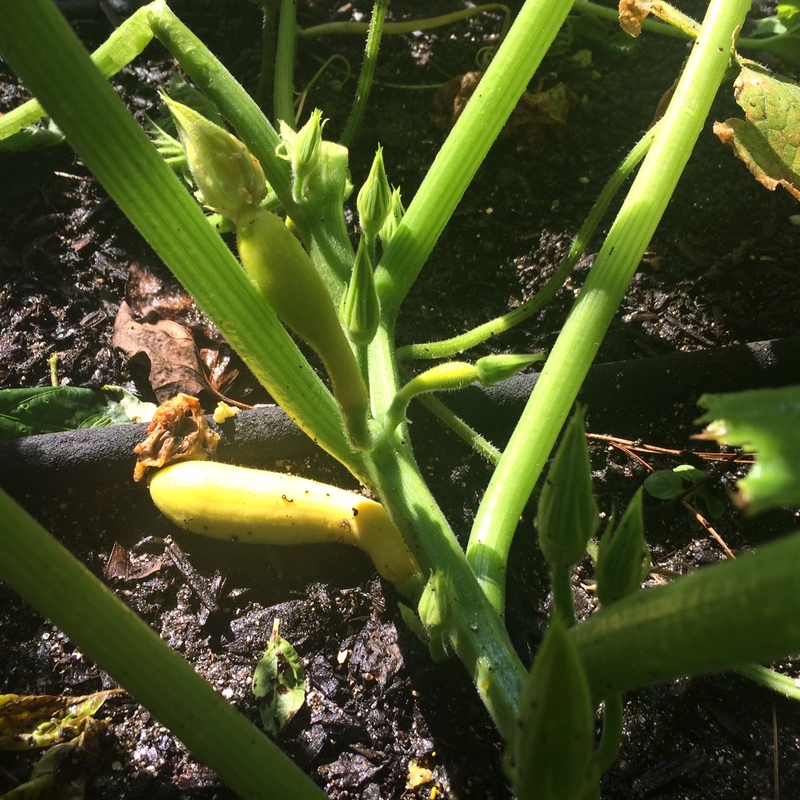 I would see squash blooms and then fruit similar to the photo to the right, but a couple of days later there would be nothing. I went on the case to investigate the cause of the disappearing squash. There seem to be two basic causes. The first is that something is eating the immature plants and the second is that there hasn’t been enough pollination of the plants for them to survive. I think there is a mix of both happening here. Since decline of the bee population, there haven’t been enough to properly pollinate plants. I also think I have garden pests who are feeding on the plants. To solve this, I need to be more vigilant about treating my plants with organic pesticides to keep pests out and do the job of cross pollinating plants if bees aren’t around. Unfortunately it looks like the squash growing days are numbered. Below are photos of my plants in July and just yesterday. Production is definitely winding down. I’ve been told by a master gardener this is normal. While disappointing, I’ll just have to enjoy the last few squash of late summer. What a difference a year makes- at this time last year the UK still wanted to be part of the EU, no one seriously thought Trump would win the Republican presidential nomination and I was still enjoying my mid-30s. 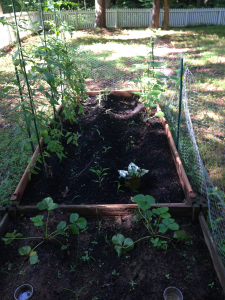 As far as my garden, this year is a huge improvement over last. I think there are four main reasons why. Larger garden box- Steve built me a new garden box which is 24″ deep. Last year’s store bought kit was half the depth. This year’s crop has room for deeper roots, making for stronger and more robust plants. Better quality soil- This year we went the route of using compost instead of soil. The richness of the nutrients in the compost encourages healthy plant growth. 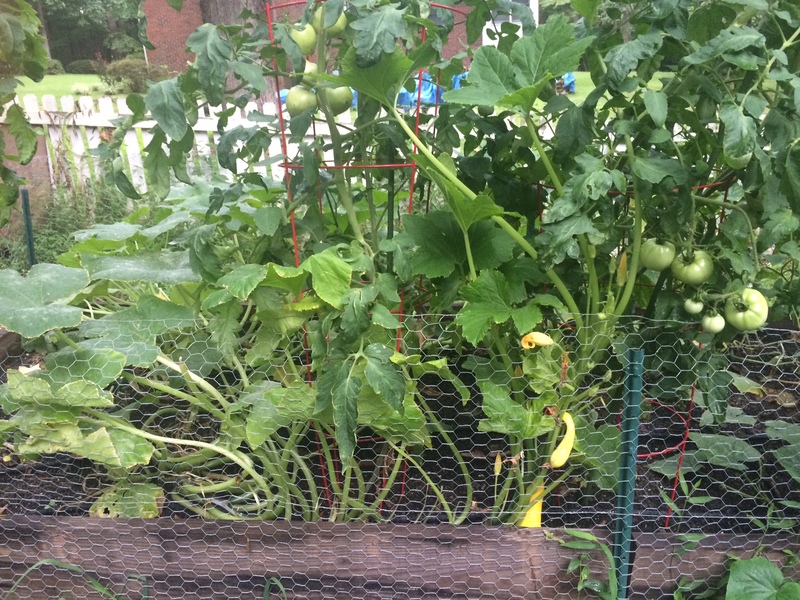 As an added bonus, the compost is better at retaining moisture than the soil I used last year. Soaker hose- This is the first year I’ve used an irrigation system. In past years, I’ve watered by hand. You can imagine how fun that is on 100 degree North Carolina days. And when I neglected my garden during the World Cup or vacation, things got bad very quickly. 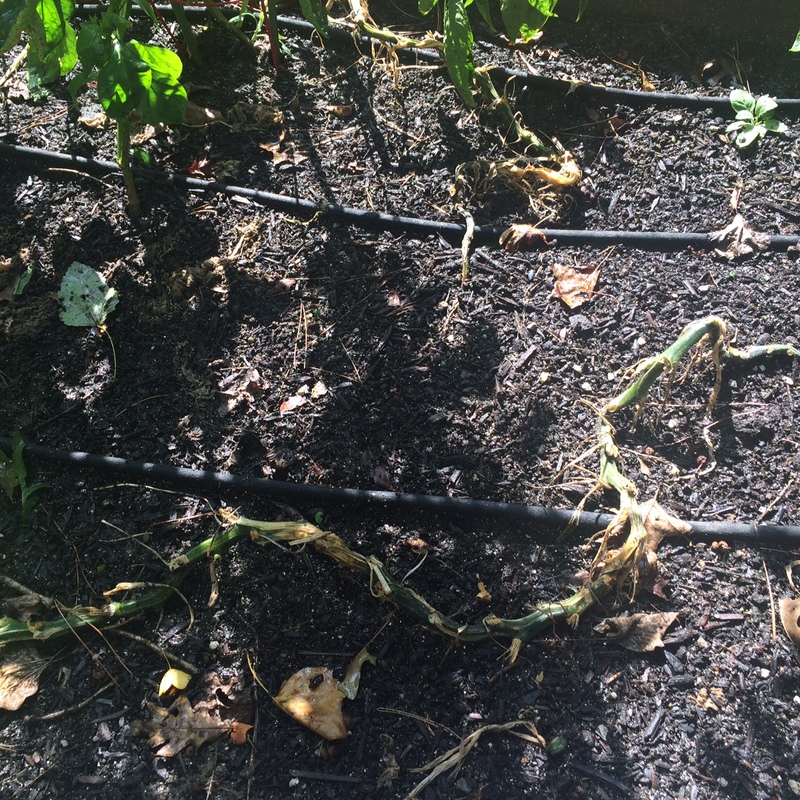 Now I don’t have to worry about watering the garden with the use of the soaker hose irrigation system and timer. Bring on the summer Olympics and ignoring all else for two weeks this August! 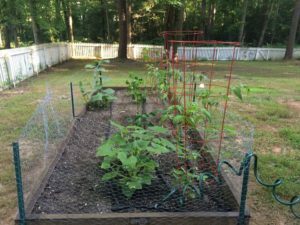 Putting gardening advice to practice- Thanks to everyone who has given me gardening advice over the last three years- from my father-in-law to friends to the master gardeners with Cooperative Extension. It took a while for it all to sink in, but it’s paying off! See below. Can’t wait to see how the season turns out!